Donald Trump made great play about his plans to take on big pharma during his presidential campaign – but his plan to cut drug prices has pleased investors and angered those calling for tougher action. But the plan, American Patients First, announced on Friday does not deliver on this promise, calling instead for more “value-based purchasing”. This would allow for money-back arrangements for drugs that don’t work, along the lines of the scheme in place for Novartis’ CAR-T cancer therapy, Kymriah. Trump’s plan also reiterated earlier proposals to make generic drugs free for some low-income older people on Medicare. The plan also includes a proposal to allow people to keep a share of the rebates currently pocketed by insurers managing Medicare, in a bid to reduce patients’ out-of-pocket costs. 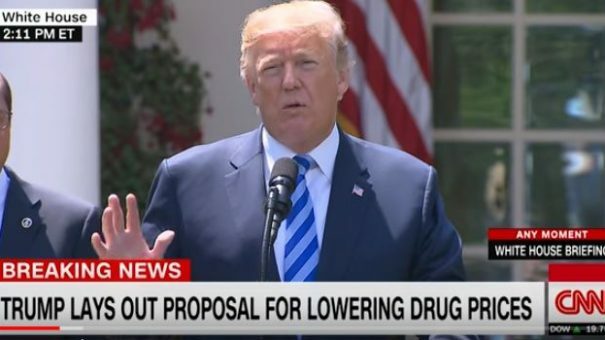 In his speech Trump also took aim at “freeloaders” – such as the many European countries that use various methods to negotiate lower drug prices. Trump’s argument is that by negotiating lower prices, countries such as the UK are not paying their share of the R&D costs necessary to bring drugs to market. The document is thin on detail, and asks what can be done to put pressure on other government to pay more for their drugs. “It’s unfair, it’s ridiculous and it’s not going to happen any longer,” Trump said. Other proposals in the plan include ensuring hospital-owned outpatients departments pay the same low fees for drugs charged to Medicare and Medicaid hospitals and doctors. Trump also talks about ensuring inpatients and outpatients in Medicare always have the costs of drugs reimbursed fully for the drugs prescribed, and are not overpaid or underpaid depending on local funding arrangements. Those on the other side of the political spectrum also calling for lower drug prices criticised Trump’s watered-down plans.